Ingredients: sugar, cocoa butter, whole milk powder, cocoa mass, emulsifier: soy lecithin, natural vanilla. Added ingredients: dried pineapple, dessicated coconut (cocoa solids 33% min; milk solids 20.5% min). Our own taste of paradise! This studded bar is basically our version of an alcohol-free Pina Colada. A Pina Colada is a sweet cocktail made with rum, cream of coconut and pineapple juice and it has been the official beverage of Puerto Rico since 1978. 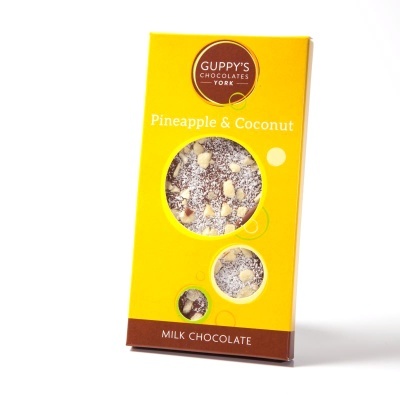 The combination of pineapple, coconut and chocolate is both mellow and fragrant.